The common picture we have of wind turbines are the ones which stand on tubular towers and have three rotor blades, varying in different sizes. The design is very much similar to the windmills of old, which were used to pump water and grind grain. 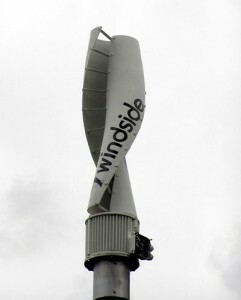 However, Risto Joutsiniemi had already developed another kind of wind turbine over two decades ago – the Windside vertical wind turbine. Its a unique product which has many advantages in comparison to the horizontal wind turbine, most notably that they are able to operate at very low wind speeds and in extreme temperatures. I became aware of Windside a few years back when we were doing research at the University about wind turbine manufacturers in Finland. The Windside turbine stood out, being completely silent and able to operate in different environments – from the freezing and snow swept mountains of Antarctica to the blazing Sahara desert, the Windside turbine worked in the harshest of environments. Add to this that it can already operate in wind speeds as low as 1-3 m/s and that it doesn’t kill birds and you’ve got a superb product. The company is not currently marketing their product for energy production, but as wind turbines for charging batteries, sending signals, pumping water and providing light, heat and ventilation; aimed at the professional market. The turbines are used on ocean buoys, remote telecommunication posts, expedition ships and lighthouses. Nevertheless, they are currently developing a product for energy production, so we are curious to see what they come up with. Somewhere in the depths of their website they explain that the current turbines could be scaled up to tens of meters, which would be an interesting development. Windside has over 340 shareholders, but they are looking for a main investor that is ready to invest about €20m. I speculate that this will go into R&D and production of their new turbine. The majority of their clients are professional marine, safety and telecommunications companies, but if you have a cottage on an island and are looking for a way to power your TV, you also can buy one of their smaller models at Bauhaus in Finland. The lack of marketing for the consumer option really has me puzzled: every cottage owner I talked to loved the idea of the turbine, but has never heard of it. Given that Windside says their product has a lifetime of 100 years and can then be recycled, I am perplexed as to why they do not market themselves more to consumers. The bottom line is that I am still fascinated by the Windside turbine, and should I one day become a cottage owner I will get one to power the fridge. But I wonder if the archaic website together with the limited marketing is helping the company in its search for an investor, especially if I see the efforts their competitors Helix Wind and TMA make. It also seems a turn in strategy would be advisable, and to concentrate equally on consumers and professionals – and in future on energy production. Wind energy is growing in importance in today’s energy mix, so it would be sad to see Windside being unsuccessful in the age of renewable energy.